Whether you are following a vegetarian or vegan diet, or have joined in the practice of "meatless Mondays," a few more recipes under your belt is always helpful—and if they pack a little bit of kick, even better. These 8 vegan and vegetarian dishes are all bursting with delicious flavors, healthy ingredients, and spicy touches. Best of all, they're quick and easy meals you can enjoy today. Although the recipe calls for sweet chili sauce, don't be fooled—it has plenty of crushed dried chili to bring some heat to his healthy dish. This quick and easy stir-fry is packed with protein (from the tofu) and vegetables including broccoli, mushrooms, and bok choy. The tofu is marinated in hoisin sauce and brown sugar and then dusted in flour; this gives it a nice crispy exterior. When combined with the vegetables and flavorful sauce, the resulting dish is hearty and satisfying. A bowl of chili doesn't have to be chock full of meat, and in this vegan version, you won't even notice its absence. The textured vegetable protein (TVP) offers a meaty texture while the spicy green chili brings a bit of heat. Enjoy a bowl with some cornbread or warm tortillas and it will keep you full for hours. Top with grated cheese for a vegetarian option. This easy recipe is not only delicious but also extremely versatile. 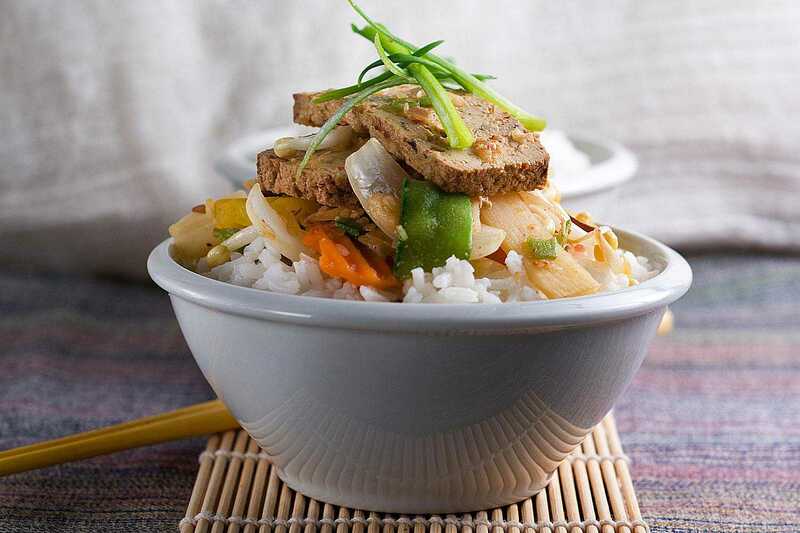 It can be served hot, cold, or room temperature, simply as is or with a variety of vegetables; it can also be topped with tofu for some added protein. The mixture of peanut butter, soy sauce, garlic, sesame oil, and ginger combine into a smooth and flavorful sauce; the cayenne pepper adds the right amount of heat while the lime juice brings a bit of freshness to the dish. A perfect recipe for a busy night, this tofu dish brings together maple syrup, soy sauce, barbecue sauce, ketchup, and apple cider vinegar with a bit of hot sauce for added kick. The tofu is marinated and then baked in the sauce making a dish reminiscent of a Chinese sweet and sour dish. With just a few ingredients—including egg substitute—you can have a flavorful vegan burger that even the meat lovers at your cookout will enjoy. Black beans are processed along with onion and bell pepper and then spiked with a bit of hot sauce and cayenne for just the right amount of heat. Pan-fry or grill and serve on a bun with your favorite burger toppings. Whether a hearty breakfast or if you are in the mood for "brinner" (breakfast for dinner), this tofu scramble with mushrooms and peppers is sure to hit the spot. And with the addition of cayenne and hot sauce, it will please anyone with a taste for spice. Feel free to place inside a tortilla for a meal on the go, or serve with hashbrowns or vegan biscuits to round out the dish. It is the jalapeno peppers that make this soup nice and spicy. When combined with red onion, garlic, corn, and kidney beans, and seasoned with cumin and fresh cilantro, this soup is a filling bowl of Mexican flavors. Top with crispy tortilla strips, shredded cheese, and sour cream (or eliminate the dairy for a vegan meal) and wedges of lime. Just because you are vegan or vegetarian doesn't mean you can't enjoy this party food favorite. Strips of tofu are coated in seasoned cornstarch, pan-fried until crispy and golden brown, and then tossed in a sauce of melted vegan margarine and wing hot sauce. Serve with vegan ranch dressing and plenty of napkins!